I grew up spending my summers in Bethany Beach, DE. A perfect little beach town in Sussex County... pretty sleepy in the winter and bustling in the summer. It's also the hometown to some seriously talented surfers, skaters, and all around athletes...These boys and girls can rip. Like my friend Dave. Dave taught me to longboard many a summer ago. I fell in love instantly and envisioned myself submitting an audition tape for "True Life I want to be a Professional Skater" Remember that show? So good. ANYWAYS... Dave and I would meet at the South Coastal Library parking lot each night after we got off work busing tables. 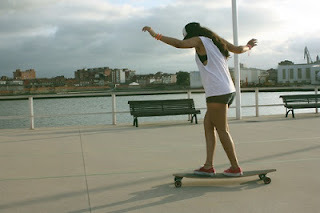 I would practice trying to stay on my borrowed Sector 9. He was patient and taught me all the need-to-knows for a beginner. True story, skating is HARD at first, but so fun. After a few days of the parking lot sessions, Dave decided I was ready to hit the streets of Bethany. Bethany is the perfect spot to cruise because around 10:30/11:00pm the place pretty much shuts down and you don't have to worry about getting hit by a car or running into crowds of people with your long board (because you don't know how to stop too well!) We were having the best time and I was doing actually well. No falls or embarrassing moments. We finished up back in the library parking lot and Dave took off. I wanted to get a little more practice. This is the point in the night where I should have just gone home. But no, not this girl. I am working on turning when things get out of control and I can not stop the board before I crash into one of those concrete blocks that are at the top of a parking space. To say "I ate it" is an understatement. Both knees had huge silver dollar sized open cuts with the skin completely scrapped off and my hands were mangled. Blood was dripping down my legs as I inched my way home, cursing myself for being too cocky. Don't worry though - once my knees healed, I was back at it. 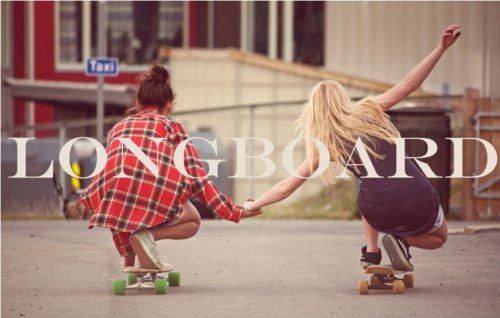 Love those longboards!